Summerside, P.E.I., is getting its very first mountain and fat-biking trails. 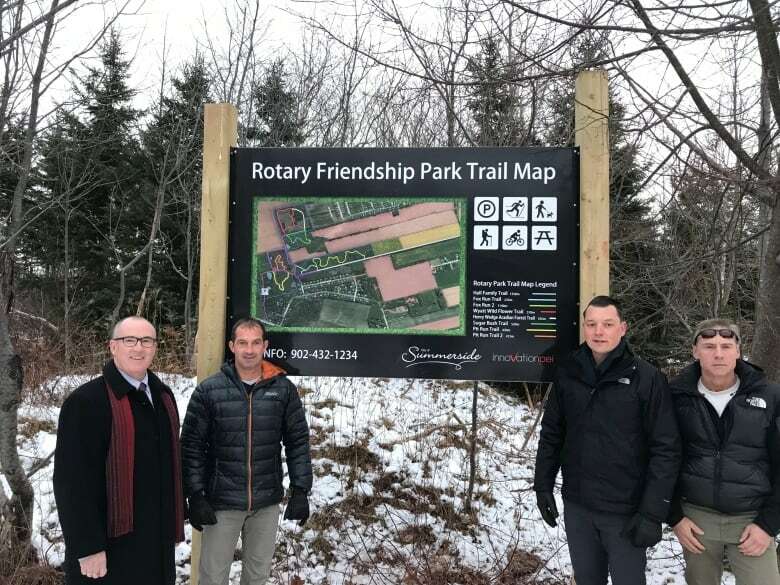 City officials had planned to cut the ribbon on the approximately two kilometres of new trails Saturday in its Rotary Friendship Park, near the Prince County Hospital, but the event has been postponed due to inclement weather. "While there's fantastic trails at Bonshaw and Strathgartney through the provincial trail structure, there were none in the city," said J.P, Desrosiers, Summerside's director of community services. "We wanted to give our locals an option so they didn't have to drive any distances to get to some more aggressive trails." Cycling enthusiasts have been lobbying for the trails in the popular park for a while, Desrosiers said. The trails have been planned in consultation with Cycling P.E.I. and built with $23,000 from P.E.I. 's Department of Tourism and Economic Development. The park currently has a network of trails for walkers, runners and cyclists. But the new trails are built specifically for mountain bikes, with bermed or banked turns and "some challenging bumps and humps to go over," Desrosiers said. There are three trails of varying levels of difficulty. Desrosiers said he's no expert but he has tried them with his six-year-old daughter and had a lot of fun — "they were fantastic," he said. "Very excited, we've been trying to increase the infrastructure throughout the province," said Mike Connolly, executive director of the 250-member group Cycling P.E.I. "Right now it's all centrally-located in and around Brookvale and Bonshaw, with very few venues east and west, so this is great." The trails were built by cycling enthusiast Albert Flavell to International Mountain Biking Association standards, Connolly said. Cycling P.E.I. has a trail groomer and plans to groom the Summerside trails this winter, so Connolly said they'll be a destination for fat-biking, which involves mountain bikes equipped with thick tires with large tread to tackle snow. Cycling P.E.I. members in Summerside "are super excited that they have something right in their backyard," Connolly said. Flavell lives in the area and is excited to share his creations — he said he plans to groom the trail Friday night after the snow tapers off and will be in the park on his fat-bike Saturday with or without "official" fanfare. 6 of the best places to ride your bike in P.E.I. There's growing interest in Summerside in mountain biking and fat-biking, Desrosiers said, so these trails will cater mostly to local cyclists. "Just a nice, inner-city trail system that you see now users throwing their bikes in the back of the car and heading out at lunchtime from the office to go try mountain biking or fat-biking, and then being back in the office on time," he said. "It's kind of neat, gets people out and gets them active so why not?" The city plans to continue to expand the trail system in the area, Desrosiers said.